As I approached Vicar Street just after 8pm on Thursday I have to say I wasn’t in particularly good form. In fact, I was in pretty poor form altogether, which was in no small way attributed to inexplicably taking a wrong turn on the way to Vicar Street adding a further 10 minutes to my journey. So as I took my seat for the gig I was feeling decidedly pessimistic about ‘The Joe Show’. 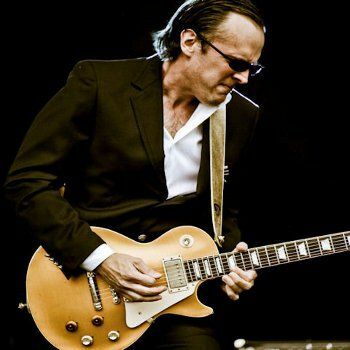 Mr Bonamassa is certainly a guitar virtuoso, and unquestionably talented, but having seen my fair share of similar gigs, (and greedy fecker that I am, a lot of other people’s share too) was there going to be something here for me that I haven’t seen before? would Mr Bonamassa be able to keep my interest levels up for a solid two hours? When Joe took the stage it wasn’t looking good, my god man you’re wearing a suit and trainers. You look like Tom bloody Green and your hair is……….short!!!. Surely no self-respecting rock god can go around sporting suits with short hair? Clapton done it in the 80′s, and that was shite, surely you’re not going to head down that road Joe? OH JOE, SAY IT AIN’T SO!!!!!!! Literally within seconds, everything was alright again. Normal service had officially been resumed. Vicar Street was suddenly a better, happier place, and both my pints tasted just that little bit better. Joe opened the show with a cover of Rory Gallaghers ’Cradle Rock‘, complete with some really deft slide guitar playing on the solo, and it rocked. Teamed with the fact that the sound quality and levels were absolutely spot on, I have to say that in terms of show openers, it was up there with as good as I’ve seen this year. So we’re up and running and off to a pretty decent start. As the gig continues and Joe powers his way through songs like ‘So Many Roads‘ and ‘So It’s Like That‘, the thing that strikes me, and is a pleasant surprise also, is how well his set-list is chosen. Joe manages to effortlessly prove his outstanding musicianship, (which let’s be honest, was never really in question,was it?) and keep the songs he’s chosen to play varied, in terms of style. Yes, all the music is heavily blues-based, but it seems that for every slow number, there’s a rockier one there to counterbalance it. For every southern rock jaunty number, there’s a whiskey soaked, 12 bar blues to follow, it’s really great stuff and I find myself really bloody pleased with myself. Joe wait’s until he’s about 4 songs in before he decides to ‘Come up for Air’ and greet the audience and wish us all good evening. The things that rock stars get away with. If I waited 20 minutes to say good evening to my missus after meeting her somewhere there’s a very high chance that she’d stab me in the head with a brick. Still, In terms of lacking professionalism, it’s hardly an Axl Rose moment is it??? We get a couple of slow numbers, with some lovely teasing guitar solos and a bit more crowd interaction. Joe is quite obviously playing heavily on the widely known fact that Audiences in Ireland are always ready to Scream HEY!!! at the drop of a proverbial hat. We’re then treated to the double whammy of ‘Steal your Heart Away‘ and ‘Sloe Gin‘ complete with guitar solo’s that just drip with class. It’s a very emotional business this, listening to the blues and Joe rightly receives a huge round of applause after these two numbers. Joe builds on the moment with ‘The ballad of John Henry‘ , while informing the crowd that the song was recently placed 12th in a poll of best guitar riffs of the last decade, and (jokingly) suggests that it should have been higher. Rock stars are so bloody arrogant. Joe’s been on stage an hour now, and I can’t help but feel almost giddy about the impending sonic juggernaut that is ‘Woke Up Dreaming’ but there hasn’t been a sniff of an acoustic guitar yet, it’s been all-electric blues so far which I was a little surprised by, considering what a fantastic Acoustic guitar player he is. We’re treated to a version of ‘Young Man’s Blues’ , as made famous by The Who and others, and Joe literally rips through it at breakneck Speed. His voice is holding up really well, and he looks relaxed, like he’s actually really enjoying himself. Joe is rightly again treated to a standing ovation for his acoustic efforts, the entire of the venue rise as one to applaud him. We’re nearing the end now, and Joe takes the briefest of breaks to come back for a 2 song encore. He really looks in the mood now, and his continuing crowd interaction is warmly received by a crowd that is lapping up every second of what is proving to be a remarkably good gig. So how do you make a good gig into an excellent gig? Well Mr Bonamassa’s answer is to close his set with a Zeppelin song, and not just any Zeppelin song, He’s only gone and decided to treat us to ‘Dazed and Confused‘, hasn’t he?